For a fledgling beach volleyball tour in need of attention, the National Volleyball League is content for now to tie its fortunes to bigger events. Making its first stop of the 2012 season at the Preakness Stakes, the NVL is hoping that fans at the Triple Crown horse race will check out the beach volleyball tournament in the infield and become supporters of the sandy sport. Then it is counting on the Olympics to bring the sport even more attention. 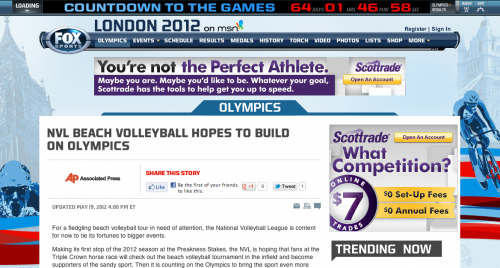 The United States has been without a cohesive professional beach volleyball tour since the AVP went bankrupt in the summer of 2010. Top U.S. players are hoping the NVL can fill the gap, providing a domestic option to compete with the international FIVB tour while helping the sport grow in this country. Several tours have popped up in the absence of the AVP, with differing rules and differing vibes. Hanneman has the advantage of knowing the players, having spent time on the AVP, and knowing what they want. In addition to Rogers and his teammate Phil Dalhausser, who have qualified for London, 2012 Olympians April Ross and Jen Kessy will compete in Baltimore this weekend. The event begins on Baltimore Beach near the Inner Harbor, with the finals on the infield at Pimlico in the afternoon before the Preakness. “The fact that Alb stepped up and created a tour out of nothing when the AVP folded helps beach volleyball survive in the country,” Ross said in a telephone interview from the event. Dalhausser said he’s noticed fewer young Americans coming up the ranks. For one thing, it’s harder for them to break into the competitive international tour. The NVL is hoping to solve that problem. The tour announced Thursday it has signed three sponsors, agreeing to multiyear deals with Club Med, Asics shoes and Surgex nutritional supplements. The goal last year, when there were four events, was to build momentum going into an Olympic year. There are six events planned for 2012 — two before and four after the London Games. Hanneman said he wants to get to 10 or 12 next year; the AVP had 22 in its heyday, and that’s on Hanneman’s radar as well. The tour also has 26 collegiate events, which Hanneman said fits with the tour’s commitment to grow the sport from the grassroots. “But it’s all got to make sense,” Hanneman said. “The Olympics is going to magnify everything. The world wants to know what our Olympians are doing. We understood that. We want them to be there to celebrate with them.